Hello! Welcome back to another day of Lawn Fawn Inspiration week! Today we are playing with some "simply" wonderful sets, Simply Celebrate & Simply Sentiments. 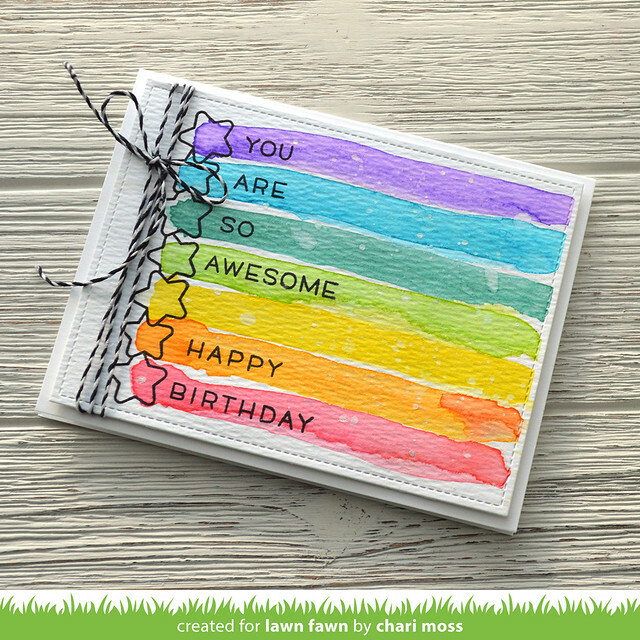 These two stamps sets were designed to work together an allow for quickly made simple cards. For this card I tried something out of my comfort zone, free flowing watercolor. I do struggle with things I can't control, which is why I don't watercolor very often. I really should practice more. But in the mean time I tried something simple. Full disclosure it did take me three attempts it looking presentable. I stamped the stars with antique linen ink first just so I could see their placement. This let me see where to start my watercolor stripes. I created the stripes by smooshing some distress ink on my craft mat, adding a little water then pulling the color from the star to the edge of the paper. I flicked some white gold watercolor droplets over the colors once they were dry. Then I stamped the stars again in black and the sentiment as well. I finished it off with some black twine and then popped it up on foam adhesive on the card base. 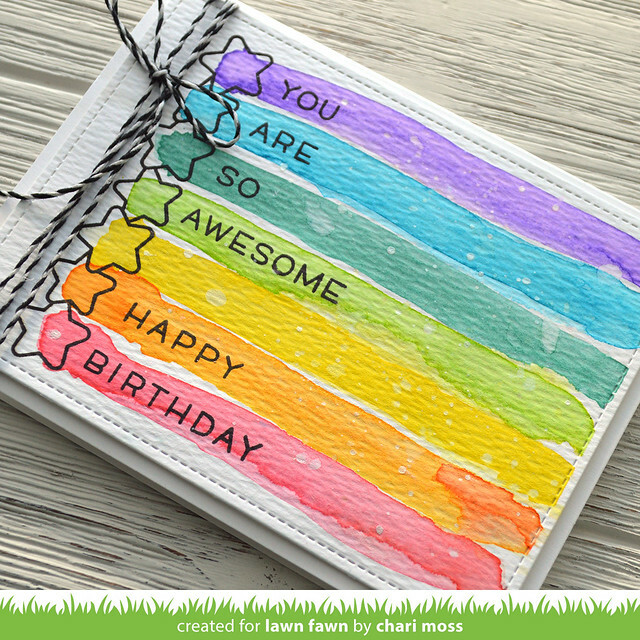 Be sure to check out the Lawn Fawn blog for more Simply Celebrate & Simply Sentiment designs. Gorgeous! Love the rainbow of colors with the stars. This card is AWESOME too!!!!! Such a great card! Your watercolor is great--I haven't quite mastered that medium. I also need to practice!